Christmas is still a long way to go and why am I a baking fruit cake? Oh well, I am trying out one or two recipes now and if I like it I will bake it for the coming Christmas. I will usually use my old fruit cake recipe but I am a bit bore with it so I want something different this year. Today I tried out the famous CMG Kek Kukus Buah Buahan or Steamed Fruit Cake . I aged this cake for a few days before cutting into it. This cake is really moist and full of caramel flavor but a bit too sweet for me. If not it will be perfect. So the next time I make this I will cut down on the amount of sugar. I have another half of the cake left and will try it out in a few weeks time and see if there is a different in taste. 1. Line and greased a square or 9” round baking pan. Prepared the steamer. Sift all the dried ingredients and mix in the dried fruits and set it aside. 2. Cream brown sugar and butter until light and fluffy. Add in the eggs, one at a time and beat well. Slow down the mixer and add in the flour and fruits. Mix well and turn off the mixer. 3. In a small saucepan and over medium heat melt the sugar until it turns golden brown. Turn on the mixer again to slow speed and slowly drizzle in the hot caramel into the cake mixture. Mix well. 4. Pour batter into prepared pan and cover the top of the pan with aluminum foil (to prevent water from dripping into the cake while steaming). Steamed over high heat for 4 hours (I steamed only for 3 hours). Remember to check the water level of your steamer every now and then and please add only hot water to the steamer. Note: Please be careful when you drizzle in the caramel as it is very hot. If you are using dried apricots, pineapple and papaya you have to chopped it up first. 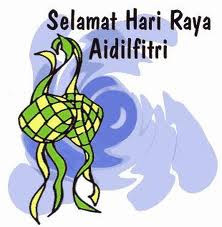 I would like to this opportunity to wish all my Muslim friends and readers “Selamat Hari Raya Aidil Fitri” Hope you all have a joyous celebration with your family and friends back home. Most importantly, drive safely to your destination. Steaming it is great for it use less engery. Wonder if I could use dry apricots in it? Today I went to MG's blog and I saw the issue of his pic of this this steamed fruit cake being stolen, edited and published in a popular local food magazine without his consent. The publishers promised him an apology in the next issue, but it never came about. Maybe local readers should all boycott Saji magazine for doing this to CMG. I hope this doesn't happen to the rest of the local bloggers. This is the link that CMG says the magazine failed to apologize as promised. I'm sorry to other readers as it is written in Malay and it's not proper textbook Malay, but witten with local spoken slangs. Gert, this fruits cake looks delicious, I bet my husband will love it. There is a typing mistake in the flour measurement. I think should read 300 g.
I prefer to steam fruit cake as it 'plumps up' the fruit and makes it soft and the cake is nice and moist. To make it less sweet, I cut down on the sugar slightly and add walnuts. My aunt used to make a similar cake for me and I want some now! Very very nice steam fruit cake. I also long to try this but haven't materialise. I must try this but without the caramel i guess.. and wow have to steam that long hours huh..hehe but worth trying. hi gert.. sekarang nih saya tengah kukus kek nih utk jamuan hari raya nanti. kek nih sedap dan moist bila hari keesokannya.. makin dbiarkan lama makan moist. tuh yang ai buat lagi. hihi.. This cake looks delicious. I never did like the kind with candied fruits (although they are pretty in color). These dried fruits make it so much more yummy! Oh.. this is my first time see steam fruit cake. I wonder if it's quite the same as the bake one. Your fruit cake contain lots of ingredients. Must be very yummy! Wow...4 hours of steaming! I have never made a cake that takes so long to cook. Looks very moist and delicious. This cake looks as good as those bake ones! But leceh cause have to look over the steaming water. haha... Thanks so much for sharing & hope you're having a wonderful time. p/s So, are there any Muslim friends there to celebrate this festive season with you? Donna, I added dry apricots to it too. Tigerfish, ha ha you said it well. Anon, sorry for the typo. I already made the changes. Busygran, yes this cake is really moist. I just cut into the one that I aged for a while and it stays moist. Elin, you have to try this cake for the coming x'mas. I am sure you are going to like it. This cake is not as dry as the bake one. Jessica, for me I never like those mix fruits from the packet that is why I mix it on my own with my fav dried fruits. You can do the same too with your fav kind. Grace, I prefer the steam one as they are not so dry like the bake ones. Mary, this cake keeps really well if you steam it longer. Katie, this recipe is a keeper but the next time I make this I will reduce the amount of sugar. Kristy, ha ha I guess you won't make this cake because of the longer steaming time. Oh yea I will be visiting some Muslim friends at Harrisburg on Friday and our Malaysian ladies might preapare some Hari Raya delicacies next week too. This looks perfect! I have never had any fruity steamed cake before. this is great! i've been looking for a steamed fruit cake recipe since i don't have an oven yet. thanks so much!